After watching yesterday’s pathetic attempt at a press conference, I’m thinking this should be a gin & tonic. 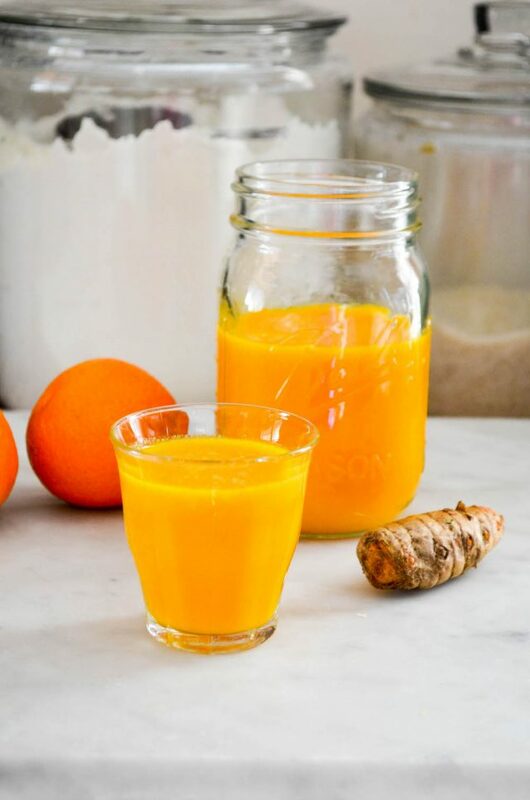 Since that won’t help any of us stay healthy during cold and flu season, a Citrus, Ginger & Turmeric Tonic will have to suffice. Of course, the best salve for the next four years might be a group cryogenic freezing session for the 65 million + of us who voted for sanity, equality, and humanity. But there’s no rest for the weary or bereaved. In eight days the reality, one that has been unfolding painfully with each suggested appointment and late night votes to strip Americans of affordable healthcare, takes hold. As our current President, a man of prestige and honor, said in his farewell address, it’s up to us now. Writing so candidly here is not an easy task. No matter how thick a skin I grow, the rude emails and comments take their toll. That’s why I took a much needed break from here, and social media while I was on vacation in Europe. I’ll be honest, there were some moments when I thought of just leaving this all behind. Stepping back gave me time to really think about the world in a larger perspective. I’ve been pondering what really matters with regards to how I spend my time while trying to balance work and motherhood. I’ve no definitive answers on what will happen with this space. I’m not one for grandiose declarations. What works today, might not be what I need the day after, or the day after that one. I do like keeping this a space where people can come, and share in their solidarity of hope, even when so much of what we see happening leaves us feeling hopeless. And I love sharing recipes that inspire me, and in turn hopefully inspire you. So, for now, I’m going to keep this pot simmering here. I won’t censor myself, but I also won’t force myself to feel like I have to be here, just as if you don’t like what I write, you don’t have to be here. 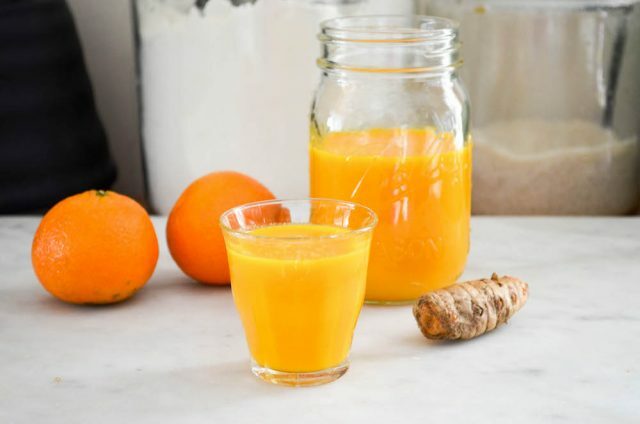 As for this Citrus, Ginger & Turmeric Tonic, freshly squeezed clementine and lemon juice ensure it’s filled with Vitamin C. The ginger and turmeric have natural healing qualities to help with inflammation (muscle pains and soreness), upset stomachs, nausea, and immunity. 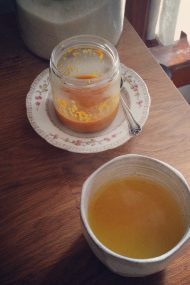 My turmeric tea is what inspired me to make an elixir I might be able to get the kids to drink. I love it straight up, but suppose you could water it down if you wanted. One quarter cup a day is how we’ve been drinking it the last few days. You can have more if you like, I suppose. As with any homeopathic remedy I share, remember I’m not a doctor, so feel free to research the healing properties of each ingredient on your own. If you have a juicer, you can throw the ingredients in it, and there's no need to strain the pulp. Since I've got limited kitchen space, I use my blender (nothing fancy, just an old Oster) to make this soothing winter tonic, filled with Vitamin C.
Add the clementines, lemon, ginger & turmeric to the bowl of a blender. Blend until smooth. Set a fine mesh strainer over a bowl. Pour the mixture through in batches, gently pushing down the pulp with a rubber spatula to release the juices. Discard the pulp. You should have about 1 cup of juice when done. Feel free to double or triple the recipe, as desired (you may need to blend it in batches depending on the size of your blender). One serving is ¼ cup. I’m so glad that you’re here, and that you write as candidly and honestly as you do. Of course, it helps that I agree and feel the same way. But I find such comfort in every voice that shares my fears right now. It reminds me how many of us there are and gives me hope that we will find small ways to resist and win and that things will get better in time. Please, please Jennie, don’t give up on us. It’s a horrible thing to speak honestly and have one’s ‘friends’ become attackers. I’m sorry this is the new world. I remind myself that I’ve been privileged to live outside their world. And I hope you have read the eloquent statement…oops, on Facebook, from someone who pointed out exactly why they are no longer our friends: bigotry, misogyny, dishonesty and just plain bad manners. 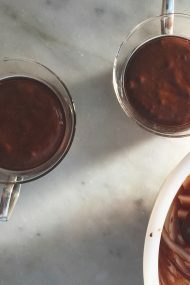 Thank you for sharing your life and recipes here. Your words are very refreshing – easy for me to say since I agree with you. I’m still in denial, and hoping for a miracle in the next week. A lot of bloggers turn off commenting on blogs. You will still be able to write and share but it will avoid having to read the nasty comments. Turn off notifications on other social media for a while. They are your accounts, so you are in charge. No need for negativity, we have enough stress to deal with in our lives. This tonic recipe looks great. I’ve been using a lot of turmeric lately in various recipes. And ginger – love ginger. Thank you for your writings and your recipes! You and other like-minded writers/readers might enjoy the letters from Penzey’s Spices as well. 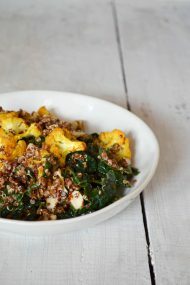 To get back to this recipe, can I use dried turmeric in lieu of fresh? And if so, how much? Thank You!!! And hopefully we’ll find some Happy in the New Year. I enjoy reading whatever you care to share! I also agree with you..,I urge you to watch Blackish it is a half hour comedy on Wednesday evening at 930, I think on ABC Watch last nights episode to the very end, it follows the aftermath of the election, very well done, I am not one for shows giving me a message, as I watch these shows to be entertained, but truly this is s can,t miss episode. I wrote you when M passed away. You and I have lost our partner at about the same time. I am still mourning, and the current political situation we are in is not helping my dark mood right now. My friends are supportive, but I still walk around with this big hole in my heart. I have lost friends and relatives over this last election. I have to figure out a way to heal these relationships, as this despicable person should not have this much power over our lives. I am from France, and my friends do not understand how this could happen here. They are also worried about this year’s election in France. I so enjoy your writing, and your recipes. Hang in there. Enjoy your girls, as I enjoy mine. I think that you write so eloquently and agree with all of your sentiments regarding the incoming administration. Have you watched the show “Blackish”? Last night’s episode was super timely and even attempted to voice the perspective of a Trump supporter in a respectful way. It’s worth watching and generally touches on social justice issues while being funny. Thank you for being out there, and for sharing so many aspects of life, nourishment, impossible grief, motherhood, France and the many small joys that give us a grateful pause in life. You are very much appreciated. I would miss your word’s, but you have to do what is best for you and your girls. Fortunately, I have the gift of your cookbook. I too am dreading the reality facing us soon. I will miss the dignity and grace of the Obama’s. I stand in support with you. I appreciate knowing how you are really feeling – honestly, some “lifestyle” blogs and food blogs have annoyed me by not even briefly acknowledging the events of the last two months and I find that impossible – the world has changed. Even if they are happy about the changes, I want to know that about the places I visit and read. I likely wouldn’t continue reading there if they were happy – but maybe that’s for the best. I like to know that I’m not alone in my worries and am not the only one working hard and wondering about the future of my kid. It helps to know we are in it together and life is not just business as usual. Oh, can’t wait to blend this up. Just purchased fresh turmeric and ginger and was going to make tea but this sounds lovely. Keep sharing! Sorry you’ve been discouraged by mean/rude/unkind people. Maybe the readers that support you, me, need to step up and tell you! I totally feel the way you do about the election results. I totally cannot understand what people were thinking. Don’t stop writing and sharing your feelings. A break is always good but we must not be silenced! I too lost my beloved, and it is hard! You have every right to say and write what you feel! I hope this meditation I inserted below will work. I encourage ALL to watch it and honestly, it WILL help (and give you an AMEN, although not in a religious way) ! You will smile, maybe spit your food out, but its worth it for 2 minutes and 29 seconds! I’m with the commenter above who has started wondering about the bloggers who DON’T mention being freaked out or disappointed by what has happened. My friend told me tonight that her entire perception of America changed in a way it never would have if someone Republican but less heinous as a human being had won. And I had to agree with her– mine has too. We both knew that there were a lot of bigots out there, but so many? My own father-in-law voted for that jackass, and yes, it has changed how his grandchildren think of him (my husband was not surprised). But that was a choice he made. I should add: my friend was stopping by to pick up a pink “cat-ears” hat I knit for her for the March and will be crossing “go to a demonstration” off her bucket list. I’m shipping a bunch of hats I knitted for marchers in DC. I guess we know who our tribe is now. re: commenting – makes me so sad to hear you have problems with commenters and can see how it might be best to turn it off. Would be a shame to lose feedback on recipes though! re: homeopathy – fruit juice/herbs are not homeopathy. Maybe “herbal” is a better word? Knew you’d like it! I have it as an app on my iphone. I probably listen to it two times a day, sometimes more! Jennie, I’ve been following you for quite a while now and so appreciate all of what you write. I Am alternately despondent at where we are post-ejection and heartened by what I see awakening in our country as people who never felt the need to resist, speak up, or protest find their voices. Some if us are loud and strident, some of us are calm, direct, tenacious. We need every voice now. Thank you for yours — clear, true, forceful. Ha! A Freudian slip above … ejection! Wish it were that easy…. I enjoy your recipes and your writing. More than half the country is with you! I think we have to believe what Dr. King said: “The arc of the moral universe is long, but it bends toward justice.” And we have to keep speaking out respectfully but boldly. Thank you for sharing with us. Yes, Lydia, you are correct. Herbal remedies are a more appropriate way to describe it. Regarding that Washington Post article you shared, I think it’s just another way of trying to oppress women. What right does one journalist have to say that “this is the only way” to protest? Do I see the same value in the hats as the women making and donning them? Not necessarily, but it’s a form of activism, and to tell anyone that the way they’re choosing to push back (provided it’s non-violent), is simply wrong. That’s almost not better than the religious right trying to push their view of God and the world on the rest of us. There are many ways to come at this, and it’s going to be a fight for the long haul. Let’s keep some perspective. You are a tremendous inspiration to a young progressive trying to learn to cook AND keep sane in the Trump regime. Thank you for modeling incredible motherhood, grace, and kindness! Best wishes. I have read your blog for years and feel the same sentiments as you over what is happening in our country. I welcome all your comments and I do think it helps me feel less alone with what is happening. I would be sad if you stopped your blog but would understand as well. I always enjoy your posts, recipes and hearing about your interesting life which is so different than mine out in CA. I look forward to your posts and in this sad and often frightening time, count on your voice of reason. None of us is alone! Are you and your girls going to find a more local march this Saturday? I took my son to a pro choice march in DC when he was about 12 and it was powerful for him. I made this probably the day after you posted it because it sounded so perfect and I had all the ingredients in the house. Guess what? It WAS perfect. The balance of flavors was delicious. I will definitely make a larger batch next time. I to am glad to read your comments. It makes me sick to think that people voted for him. This is your space and you can write and say anything you want. I love you and this blog and have been following you for years. I totally agree with you!!!! In our next 4 meek years we need to band together. Please keep on writing your thoughts and posting your recipes.